Originally posted at my EdWeek Teacher blog, Capturing the Spark (10/14/16). 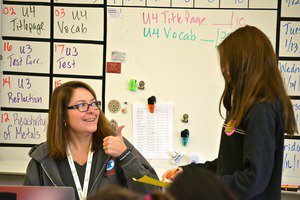 Science teacher Mary Martin, with a student at Union Middle School, San Jose, CA. Athletes performing well under pressure are in the exact position they want to be in. They’ve put in years of work for a chance that they weren’t even guaranteed would ever come. The pressure felt by teachers is not as acute. We don’t have millions of people watching, ready to dissect our every movement and every decision in the media seconds after we finish our work. I don’t know too many teachers who crave that kind of intensity or scrutiny. Slow and steady wins the race, as they say. But we do want to be in the race. We can handle the right kind of pressure in the right conditions. When the pressure is inappropriate or excessive, it certainly takes a considerable toll on teachers. How can we tap into the performance-enhancing kind of pressure, and mitigate the stress? It seems like every education article or blog post I’ve read lately has examined some facet of the problem. So even if teachers train for the job, like a professional athlete, and accept the high stakes of the enterprise, it’s the constant change that undermines performance. Going back to the baseball analogy, imagine reporting for spring training each year only to find that the standard sizes, weights, or distances have changed, and the rules have been modified. It would be hard to maintain the necessary confidence to be a “clutch” performer. “in schools where teachers report strong trust and cooperation among adults, students said they felt safe and cared for, as well as more academically challenged. And stronger student test scores often bear this out. In my recent education reading, these are the people who seem to get it, who understand the essential foundations of school improvement, who, if they were baseball managers, would know how to cultivate conditions that bring out the best in their players. Hint: don’t discount their views, ignore their needs, destabilize their regimens, and push them into high stakes situations where success is poorly measured and of ambiguous value. Then, we have one education writer who doesn’t seem to get it. Joe Mathews is a smart guy who unfortunately has been writing op-eds for over a year criticizing the state’s new approach to accountability. I noted in one of my prior posts that I think California is moving in the right direction, chiding the L.A. Times Editorial Board for suggesting we eliminate the new system before it even began. Mathews takes the same approach. His most recent piece is titled, “California’s New Education Architecture Is Already Failing” – a bold claim to make about architecture that’s not entirely in use yet. Mathews has written about California politics and policy for many years, and he has a sophisticated understanding of our state’s history and politics. I have to wonder then why his pieces are so intent on highlighting his befuddlement. Cracking open his thesaurus, Mathews describes the regulations and their supporters as more than confusing: confounding, foggy, incoherent, lame, long-winded, unsteady, sprawling, cynical, incomprehensible, idiocy. Taking Mathews at his word, I believe that he’s genuinely concerned that the complexity of the new system will make it difficult for schools to comply with regulations, and that community members won’t easily grasp the new information. He’s right to be concerned. It is a complex system, and it puts a burden on local districts and stakeholders. In the effort to craft an accountability system that is more robust, authentic, and logical, the state will need to mitigate the compliance burdens and help with communications to stakeholders. However, Mathews has been on a mission to undermine this system since its inception. He implies that the now defunct Academic Performance Index (API) system, was better. It wasn’t. Like most states, California had rankings and ratings based almost entirely on standardized test scores. Those scores are easy to present, but their simplicity was their weakness. Too many schools, facing intense pressure to raise their API, made predictable mistakes in prioritizing test results above all else, and the scores never said as much about the quality of teaching and learning as Mathews seems to believe. In watching this process, I can’t help but wonder if all the confusion isn’t cynically deliberate. Throughout, the state has followed the advice of its powerful teachers union, the California Teachers Association, which has opposed any system that offers coherent ratings, and thus meaningful comparisons, of schools. The union prefers to have as much evaluation as possible done at the local level, where they are most powerful. The ratings Mathews sees as coherent and meaningful were in fact narrow, oversimplified, misleading, and even damaging. There’s nothing cynical about wanting to move on to a better approach. Maybe there’s some projection involved here; Mathews strikes me as the cynic, feigning inability or cultivating unwillingness to discern meaning from multiple indicators – unless the state requires that we boil it all down to a final score. If we want teachers to step up as clutch performers, helping the team when we’re under pressure, we need to put teachers in situations where they can succeed. When the only measure of success was the continual improvement of standardized test scores, set against the constant shifts in curriculum, leadership, and standards, (not to mention the effects of poverty and inadequacy of resources), we saw an increase in stress, and a deterioration of the trusting relationships necessary for thriving schools. Give us an accountability system that factors in more indicators, including more that we truly value, and that we can more directly control. We can do better work together in a system that recognizes and values complexity, and acknowledges the humanistic and qualitative aspects of our experience.